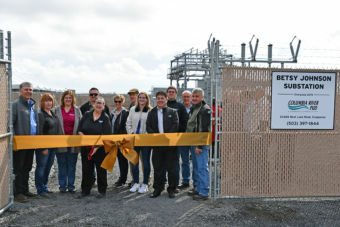 March 28, 2019 – On March 23, a crowd of about 25 people gathered inside Columbia River People’s Utility District’s newest substation to dedicate it to Senator Betsy Johnson. Inside the substation, which is not yet energized, PUD Board President Jake Carter welcomed the crowd and provided a brief history of Johnson’s civic achievements over the past four decades. Senator Betsy Johnson and CRPUD Board Members and employees prepare to cut the ribbon at the Betsy Johnson Substation dedication. “Senator Johnson’s foresight dating back to the 1980s paved the way for the industrial and commercial growth we are seeing here now,” Carter said. He pointed out that Johnson’s work in Salem helped secure significant financial support for development of the Oregon Manufacturing Innovation Center (OMIC). “With the addition of OMIC, as well as a Portland Community College campus planned right next door, and the opening of Cascades Tissues down the road, this area is booming,” Carter said. “Together, we anticipate they will bring hundreds of family living wage jobs to the community. “As your PUD, it is our job to ensure these facilities have a safe and reliable source of electricity, and families in the area have a dependable source of power in their homes. That is why we are building this substation, and the PUD employees have worked very hard over the last few years to make this happen,” he said. Before cutting the ribbon on the entrance to the substation named in her honor, Johnson asked each and every organization present to gather with her for a photo. The gesture aligned with the speech she gave a few moments earlier, during which she credited those in the crowd for necessitating the PUD to construct the new substation in Scappoose. Johnson’s short speech focused on the development in Scappoose, specifically near the airpark. She expressed great enthusiasm for OMIC. The Betsy Johnson Substation is the PUD’s ninth substation. Its capacity is 25 MVA. The PUD kept costs down by paying cash for the $1.85 million project rather than accruing long-term debt. 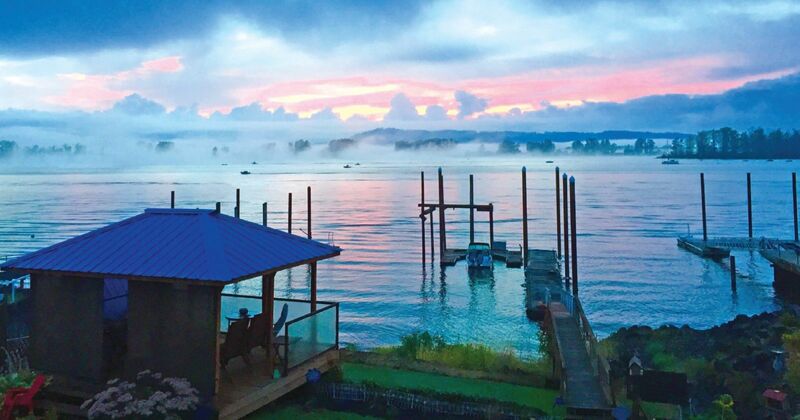 The substation provides greater capacity to accommodate electric load growth in the Scappoose area. It will ensure the PUD is able to continue providing reliable service to industrial and residential customers in Scappoose and Warren. The Betsy Johnson Substation is expected to be energized later this spring.